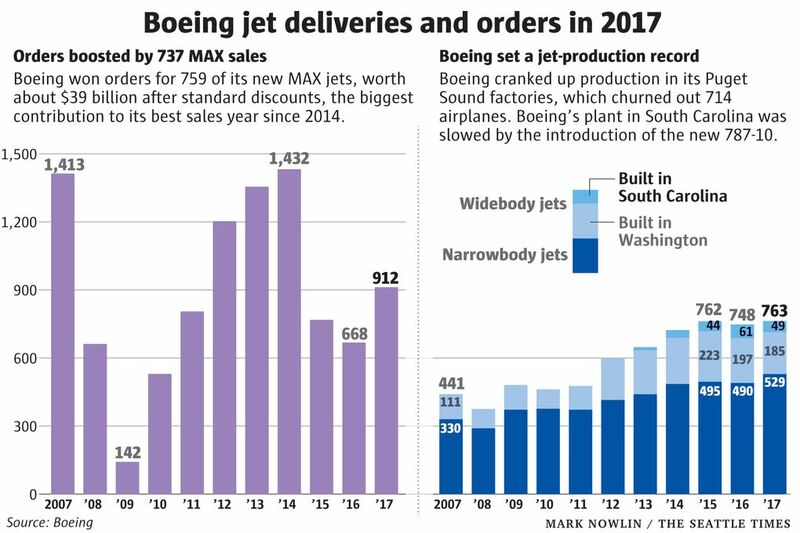 Boeing delivered 763 jets in 2017 — a production record, making it the world’s top airplane manufacturer for the sixth year in a row. Airbus reports its figures next week and is expected to have delivered just over 700 jets, though it will again top Boeing in orders. Boeing released its 2017 jet-order and delivery data Tuesday, confirming that for the sixth year in a row it was the world’s top manufacturer of airplanes. And the jet maker projects another boom year for airlines, and even higher production, in 2018. In a production record, Boeing built and delivered 763 airplanes in 2017, up from 748 jets the previous year. Its previous record was 762, set in 2015. Based on market pricing data from aircraft-valuation consultancy Avitas, those deliveries are valued at about $60 billion. Boeing also reported a total of 912 net orders last year, up from 668 the previous year. The list price of those orders, the vast majority of which are smaller single-aisle jets, is $134.8 billion. However, based on Avitas data, the actual value after standard discounts is about $63 billion. Airbus will report its final 2017 order and delivery figures on Monday. That data is expected to show it finished the year with just over 700 jets delivered. There’s scant sign of the slowdown that many airline-industry experts were predicting a year ago, concerned especially about the big Middle East carriers who’d pumped up demand in the widebody-jet market. He said air passenger traffic grew worldwide at more than 7 percent and, after years of lagging growth in the airfreight market, cargo traffic was also well up, more than 9 percent. He added that airlines worldwide are estimated to have made total profits last year of $34 billion, which means that over the last three boom years airlines have made more profit than they did in the prior 30 years combined. Boeing’s production advantage over Airbus is largely due to the 787 Dreamliner, now rolling out at a rate of a dozen jets per month. The competing Airbus A350 jet is being delivered at roughly half that rate. According to the definitive All Things 787 web database maintained by blogger Uresh Sheth, Boeing delivered 136 Dreamliners in 2017, of which 49 were assembled in North Charleston, South Carolina, and 87 in Everett. 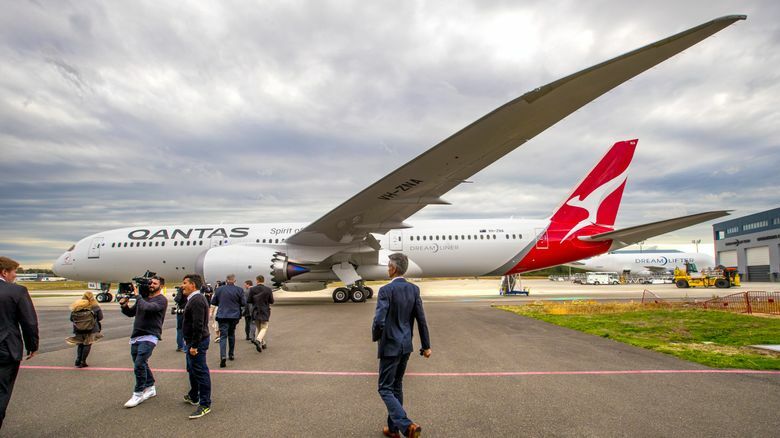 Production in South Carolina was down from 61 jets the previous year, slowed by the introduction onto the assembly line there of the first models of the largest Dreamliner, the 787-10. Boeing’s Puget Sound-area factories delivered a total of 714 airplanes. Cuts to 777 production and slow rates on the 767 and 747 jets were more than offset by increased rates on the 737 and the 787. The Renton plant geared up its monthly production from 42 to 47 single-aisle 737 jets in the fall and ended with a record 529 jet deliveries for the year. In Everett, the production rate of the 777 was slashed to just 3.5 jets per month in August as Boeing prepares to transition that assembly line to the new 777X. However, 787 production in Everett at seven jets per month boosted total Everett deliveries for the year to 185 widebody jets. The robust 2017 market confirms Boeing’s confidence in its plans to push production even higher. Tinseth projected continued airline prosperity in 2018, forecasting passenger traffic growing at 5.5 to 6 percent, above the long-term trend of 5 percent, and with airlines expected to reap about $38 billion in profits. He said Boeing will go ahead later this year with its plan to raise 737 production in Renton to 52 jets per month and then to 57 per month next year. “We continue to see upward pressure” on production rates, he said. Likewise, 787 production is on track to go to 14 jets per month in 2019. Tinseth highlighted the Chinese market as particularly important. He said a fifth of all 787 flights begin or end in China. This year, Boeing will finish construction of its 737 completion center in Zhoushan, China, where 737s going to Chinese carriers will be painted and fitted with seating and in-flight entertainment systems. The plan is for about 100 jets a year to be finished in China, which Tinseth said will help Boeing achieve the higher production rate in Renton. The one weak spot in Boeing’s results was for its aging jumbo jet, the 747. But 747 cancellations outpaced orders for the year, leaving just a dozen jets still to build — all freighters. At the current snail’s pace of production, one jet every two months, that’s a couple of years until the end of the line. Tinseth said several cargo operators interested in the 747-8 freighter jet are waiting to see if the upturn in cargo traffic is sustained before they’ll commit to a purchase. Boeing’s final tally of 912 orders is much better than many expected at the beginning of last year, largely because of a stellar year of 759 orders for the new 737 MAX. Those orders were balanced by some cancellations of the older 737 models so that the 737 family of jets ended the year with 745 net orders. Orders for the 787 Dreamliner also began to accelerate in 2017, with 94 net orders versus 58 the previous year. However, Airbus will almost certainly once again win the annual order race — for the fifth successive year. Airbus had a flurry of large single-aisle sales wins late in the year, including a massive order for 430 single-aisle A320neos from Phoenix, Arizona-based private-equity firm Indigo Partners, which backs a string of low-cost carriers around the world. That Airbus order victory is the last hurrah of longtime sales chief John Leahy, who is set to retire at the end of this month.